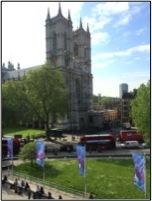 In May, our GIS Manager, Becky Burvill, went along to the ESRI UK 2016 annual conference in the heart of London. The day kicked off with the team from ESRI demonstrating the fantastic Drone2Map software used recently for a National Trust Property, Waddesden Manor. Becky had a great day following conference speakers, exploring the exposition and joining a Collector training workshop. Amongst the themes she dipped into on the day were the recent “liberation” of government data, efficiencies driven by understanding spatial data and getting technical with ArcGIS Online and Collector. Severn Trent staff introduced their application of the Collector app to reduce water quality complaints on discoloured water – saving the firm thousands of pounds each year. The day culminated in an inspirational closing plenary session held by BBC TV’s Map Man, Nicholas Crane. The famous geographer enthused about the progress of the mapping industry and the fantastic leaps forward we continue to make in understanding our natural environment.